I can’t tell you how long I’ve wanted to chat with the almighty “Menards Guy” Ray Szmanda, a living legend for these past 83 years (his birthday is June 22). Long-time Volume One friend Jamey Brownell helped shoot Ray’s commercials for several years, and our publisher/editor Nick Meyer worked with Ray for about a year toward the end of Ray’s time at Menards. Needless to say, I got pretty giddy about the idea of chatting with Ray as Nick and Jamey exchanged fond memories of the blue-sweatered icon. I even came close to convincing myself that it would be a good idea to visit his house last Thanksgiving, as I was visiting my grandparents in Antigo, Wisconsin. But, I have to say, I didn’t know what to expect when I contacted the long-time spokesperson and co-star of the forgotten B-movie The Alpha Incident. Would he have an ego and scoff at the idea of being in our magazine? Would he be bothered at the idea of revisiting the persona (he is retired, after all)? V1: So how are you liking retirement so far? RAY: Well, let’s see, it has been about six or seven years. I can’t remember exactly, because I went back for a bit after I lost my son. I retired at age 77. I’ve been keeping busy with music. Piano is my big thing. I started lessons about five or six years ago. I’ve been doing that more for my own enjoyment than for performing. V1: So you don’t have a band? RAY: No. I do it strictly for my own amusement. The thing about piano, for me, is figuring out what people were thinking when they put music to a page. V1: I also heard that you’re a drummer, as well. Is that right? RAY: Yes. I was a professional drummer. I played on the road. This is when I was young. Right when I got out of the Navy at 21. I had my own trio. V1: What kind of stuff did you guys play? RAY: We played 40s music, what we called swing. Swing lasted about 10 years, and then of course rock ‘n roll came in. V1: So how else have you been spending your time these days? RAY: Well I spend a lot of time with stocks. V1: Well it’s a fun time to be working with stocks right now. A little frustrating, I imagine. RAY: You buy low and sell high, so now’s the time to buy. Stocks are very reasonable right now. And of course I do my homework before I buy, and I have a certified financial planner who keeps me honest with my estate. By that I mean he keeps me out of risky stocks. But I have a letter that I get every month, and it has been good to me these last 20 years, that tells me what’s out there that looks good. V1: Is there anything in particular you miss as the Menards spokesman, like hearing yourself on the radio or seeing yourself on TV? RAY: Yes. I would say I really miss being on camera. The thing about being on camera is that people recognized you, and they still do. That 15 minutes of fame, for me, came to be about an hour. V1: Do people still recognize you? 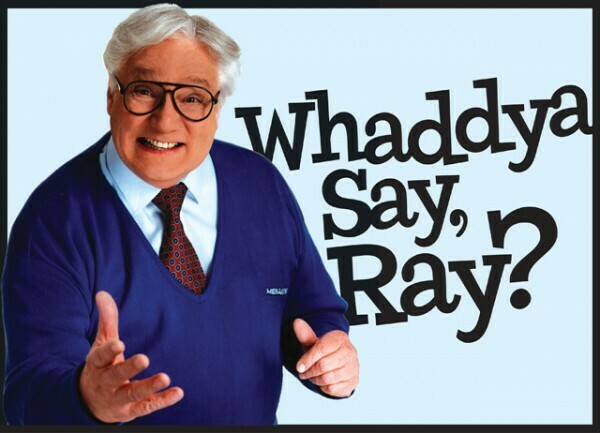 RAY: All the time. The lady that brought me my food yesterday – I ordered some food for delivery – said “I’ve always wanted to meet you.” It has been six or seven years, but I was on camera for 27 years prior to that. … There’s something about being on camera that just makes your day. I eat out quite a bit, and I don’t think there’s a time when I go out that somebody I don’t know comes up and says, “Hi Ray” or “I don’t quite know you, but your face is familiar. What’s your name?” Then we get into pictures and that kind of thing. RAY: Oh yeah. I have a stack of pictures that I send to people that would like one. I mail them to them. RAY: Yeah, it’s a fun thing. It takes a long time to get a gig like Menards. A long, hard road in broadcasting. But when you do, man it’s great. It really pays off. The effort is well worth it. And being on radio is great, too. I was on the radio years ago, and it was just great. And it’s the same today. You have a chance to act and play different parts, even with commercials. V1: What’s the trick to being a voice actor? RAY: Yeah. It’s hard to do. It’s hard not to act. V1: Do you get sick of it? You put your heart and soul into that kind of a thing, and actors do, too. And I suppose I was kind of an actor with that, because people tell me, “You’re so different off camera. You seem so quiet.” Older people looked at me and said, “Look at that guy out there. He’s got grey hair and he’s full of enthusiasm. Maybe I should be full of enthusiasm.” That was all part of the show. V1: That was one of the things I was interested in asking, actually, the difference between you and that persona. RAY: Yeah, I’m not like that. But I did the grand openings for Menards – all over the 10-state area, which I suppose has grown now. I got to meet people at store openings and sign pictures, and meet people from Indiana, Michigan, Illinois, Minnesota, all over the Midwest, and they were fun. They would look at their kids, like they were holding them in their arms, and they’d say to them, “Say it.” Sure enough, they’d say, “Save big money at Menards!” You know, that kind of thing. I got a lot of that. And I got negative things, too. RAY: Oh yeah. Absolutely. There were a couple of elderly ladies that walked by my booth, and I was signing pictures. They were free. And I looked their way and said, “Come on over, guys.” And they said, “Don’t call me a guy,” and walked right on by. This maybe only happened twice, but these are things you remember. Anyway I had another fella – I was in the carpeting department doing a commercial – and I said, “Good morning.” You know, friendly, because that’s the name of the game. Well he said, “Why don’t you get a job?” It hurt, but I regained my composure to get on the air. He must have been annoyed by my commercials. It’s infrequent, but it happens. … It’s OK, it’s part of it. V1: Do you have any specific memories during that time that stick out? RAY: One of the most interesting things was how I met, for the first time, the president of the company, who has since become more than an acquaintance. We flew together all over the Midwest for commercials, so we got to know each other pretty well. It occurred to me he might have been Larry Menard. So that was interesting, and I’ve always remembered that. There was another one I wanted to tell you about. When you do these commercials, it’s on a set. You have everything set up, the lighting and so forth. And there were two elderly people – in their 60s, maybe – that were so interested in the product we were advertising, they didn’t see any of it. The lights, the camera, director, anybody. They walked right on the set (laughing) looking for the price of the chair or whatever it was. I walked over and put my arms around the fella and I said, “Would you like to be on television?” And he popped up, “Oh my gosh!” And away they went. (laughing) That was a great one. I have many, many great experiences. Ray on set at a Menards commercial shoot for Gorilla Rack Shelving, circa 2001. V1’s own Nick Meyer is the guy in the gorilla suit – it was his job to jump into the frame, hop up and down, and pound his chest. Ray had plenty of monkey jokes for the crew. V1: What I’ve most been looking forward to asking you is – ever since I was really little my dad probably told this story a hundred times and I never knew if it was true – about when Menards was looking for a spokesman, and a bunch of good-looking guys in suits showed up. Then this guy wearing jeans and cowboy boots walks in. And they said, “That’s our guy.” Is that really how you got the job? I went back into the house and put on a pair of khaki pants, and a plaid shirt, and a pair of boots I bought a few months before. I jumped in the car, went to the audition and that’s when it happened. RAY: Yeah. I was pretty shocked, because these guys all looked and sounded great. They had great voices. V1: Was there any conversation about what you’d be wearing? Do you have a special affinity for blue sweaters, or something? RAY: Never. No. When we started, it was an orange shirt, which I liked. Then they went to a blue polo shirt. Then sweaters. The blue looked great – in fact, better than the orange – but I liked the orange material, because it stayed fresh and wasn’t baggy. V1: Obviously Menards has continued to run ads, but there’s not a distinct spokesman. RAY: Anytime you have someone that imitates you, does the same thing you do, that’s a huge compliment. I was very pleased to hear that the young man – and I’ve never met him – that does them now is doing the same act I did. V1: Yeah. Kind of. The voice is pretty similar. RAY: Yeah, and he does a great job. V1: And they’re still using your cartoon image. What do you think of that likeness? RAY: I like it. A long time ago they decided they wanted to do that, and it’s great. V1: Can we expect a comic book anytime soon? RAY: I never thought of that. That would be great. Wouldn’t it? We should learn how to do that. I thought about an animated spot for television, but it’s a very difficult and expensive thing to do. But it would be an interesting thing to do. I hope John (Menard) reads this article and thinks about it. I’ve got a film major grandson in Colorado, and he wants to do it. V1: When you were doing commercials, were there any products you specifically liked mentioning? RAY: Not really, no. I used to like working outside in the yard. So lumber was interesting. It showed the enormity of the company. I mean, they offer everything. It was just unbelievable. And it was fun working outside. Fresh air. Working high up in the lumber piles. And we had good solid people around us. A fella by the name of Bob Prock ran that production section for a long time, and did a great job. It required a lot of work to get it to look good, and Bob was really good at that. V1: What jobs have you held other than Menards? RAY: I was in radio for about six years. My television debut came for Radio City in Milwaukee, an NBC station named WTMJ. That’s when I went on television. V1: What did you do for them? V1: I hear you’re still doing some radio stuff, as a Ham Radio operator? RAY: I’m not very active. I used to be very active. In fact when I used to come to Eau Claire for commercials I was on the air most of the time. I never got my license to talk to other countries. My son did, but I didn’t. At that time, my wife and I had seven children. When I lost her, I lost a lot with it. Then I lost my son shortly after, and it was over after that. V1: I also heard you’re into antique car collecting. What got you into that? RAY: Just the love of automobiles. It’s a good hobby, but a very expensive hobby. I remodeled a Model A Ford two-door sedan convertible. A rare car. V1: Is that the gem in your garage? RAY: It used to be. I sold it. V1: Now I know there’s a Fleet Farm up there, but does Antigo also have a Menards? V1: Well I’m wondering if you feel guilty going into a Fleet Farm or Home Depot? RAY: Oh sure. Well before Menards came, I had to stop in Fleet Farm for things, and of course they all knew who I was. Now I have no reason to, unless Menards doesn’t have something. V1: That’s got to be kind of odd, stepping into a Menards. I can’t imagine what a cashier thinks. RAY: It is, but it’s fun. It’s just fun. And I don’t say much, unless they say something. And a lot of times, if they‘re shy, they don’t say anything. It’s a lot of fun, though. It’s the best part of the job. Having fun with people. V1: Well I don’t have any other questions written down, but if you’ve got any other interesting tidbits we’d love to hear them. Well I could hear the noise in the background – the music and the clinking of the glasses – and I said, “Save big money at Menards!” They said, “Far out,” and that was the end of the conversation.